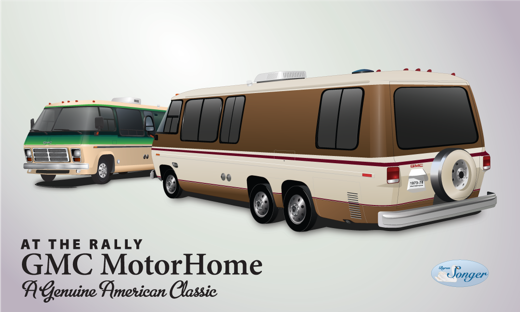 We, the members of GMC Eastern States, are committed to keeping the legacy of the GMC MotorHome alive. We also support the active use and enjoyment of these classic and well-designed vehicles as the ideal RV of the 21st Century by providing access to technical resources via the web, workshops at rallies and articles of interest through the club's newsletter. GMC Eastern States had an account with PayPal and was accepting renewal and new member payments made via PayPal. End users do not need a PayPal account to use this method, just a valid credit card. We'll try to have it back up and running if need be. We’re classic GMC owners and enthusiasts! GMC Eastern States is an affiliated chapter of the Family Motor Coach Association. Members of GMCES are dedicated to continuing and building on the legacy of the GMC MotorHome as a recreational vehicle for the ages. If you’re looking for a motorhome that offers timeless style and design, it can be found in the GMC motorhome. If you’d like an RV that is sized right, not too big and not too small, the GMC coach is it. If you want a boulevard-like riding and handling experience, the GMC has it. If you want a vehicle ready to be customized to fit your personality, a GMC is waiting somewhere for you. Or, if you’re looking for friends who are also proud owners of these classic RVs, there are GMC owners eager to meet you and share their experiences with you. Just like the vehicles we own, GMCES is many things to many people. Members of GMC Eastern States may request a username and password by simply submitting a request. Clicking the link will open a new page in your browser. Enter your name, email address and other required information on the form. In the subject line type: “Request for Username and Password.” Other information required includes your FMCA number as well as basic information about your primary coach. The site administrator will verify your membership and reply to your email with the Username and Password you may use in accessing the Members Only pages. What’s in the Members Only Area? To be succinct -- membership information, materials from technical presentations given at ES rallies, surveys of the membership so officers can keep the organization “on track”, the current and previous newsletters in PDF format, and other information that ads value to your Eastern States membership. The Eastern States website is among the better sites dedicated to RVers and the officers want it to remain that way while adding value to your membership. If you have comments, concerns or suggestions, please make them known by contacting the web and newsletter editor.